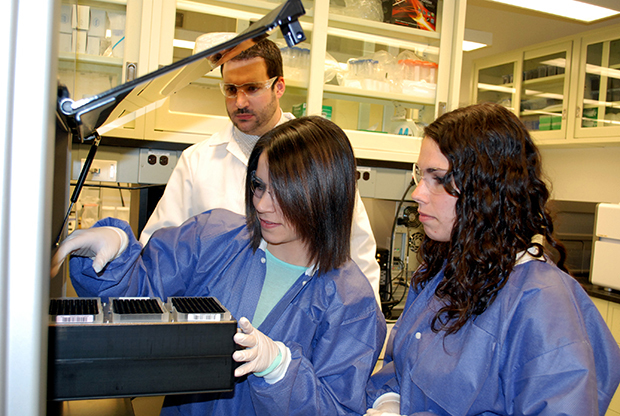 Michael Marciano oversees Danielle Lindgren ’14, left, and Victoria Czabafy ’15 in one of the new bioforensics labs. On one hand, their soaring popularity is one of the reasons she became interested in forensics. (“NCIS,” in fact, is the world’s most-watched TV drama.) On the other hand, such shows often employ techniques that would make a real forensic scientist cringe with embarrassment. And that’s just the beginning, says Lindgren, who, in addition to earning a degree in chemistry, was one of the first to complete the Integrated Learning Major (ILM) in Forensic Science in the College of Arts and Sciences. She rattles off a host of other grievances—from the preponderance of forensic gadgets and futuristic technologies to pistol-waving CSIs racing around in Hummers to so-called “scientists” who seem to know a lot about everything. Lindgren’s instructor, Michael Marciano, nods his head in agreement. During a recent afternoon on the fourth floor of Lyman Hall, he, Lindgren and chemistry major Victoria Czabafy ’15 hold court in FNSSI’s new state-of-the-art laboratory suite. Much myth-debunking is had, especially where matters of forensic analysis are concerned. That hasn’t dissuaded Marciano from becoming one of the area’s top forensic scientists. 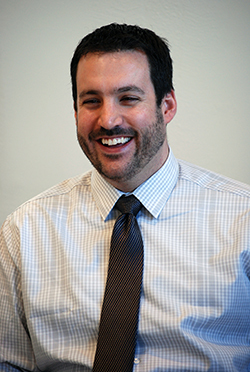 Currently, he is heading up two federally funded research projects at Syracuse: one involving the Combatting Terrorism Technical Support Office; the other, the National Institute of Justice (NIJ). Other projects include a recent collaboration with the U.S. Department of Homeland Security and U.S. Customs and Border Protection. Unlike his TV counterparts, Marciano is tight-lipped about his work, mainly for security reasons. Nevertheless, his excitement is palpable. As FNSSI’s bioforensics lab supervisor, he oversees everything from operations and personnel to budgets and effort-tasking. But the real fun, Marciano says, lies in the science, where he designs experiments focusing on the “exploitation of biologicals” (e.g., DNA) to aid in the tagging, tracking and locating of targets of interest. Marciano is proud of his professional collaborations, which are beginning to pay off for the University. They include the aforementioned Onondaga County Center for Forensic Sciences and New York City’s Office of the Chief Medical Examiner (OCME), both of which are known for their high professional standards and scientific rigor. They also enable students to participate in research that impacts public safety while enhancing their professional development. Another FNSSI partnership is with Promega Corp., one of the nation’s largest suppliers of products for DNA forensic analysis. Last summer, the Wisconsin-based company sent a trio of scientists to FNSSI, requesting R&D assistance with various products and methods. Several of Marciano’s students leaped at the opportunity, which could benefit them professionally later on. No doubt FNSSI’s family-like atmosphere, augmented by the latest in laboratory design and technology, is partly responsible for the institute’s success. The labs’ organic space assignments are enough to break down barriers between disciplines, not to mention students and faculty. Hallway meetings have a way of happening spontaneously, and, if someone has a question or problem, help is a shout away. A quick tour of FNSSI’s 2,500-square-foot bioforensics suite, valued at more than $2 million, reveals no shortage of top-notch gear. Considerable space is taken up by a large DNA analysis facility, where millions of copies of DNA are made from a single sample of genetic material. This process, known as amplification, enables detection of small amounts of DNA, a process that’s not uncommon in most criminal investigations. Marciano points out some of his “toys,” including several thermocyclers, a 16-capillary electrophoresis genetic analyzer, multiple robotic platforms and a next-generation DNA sequencing unit. 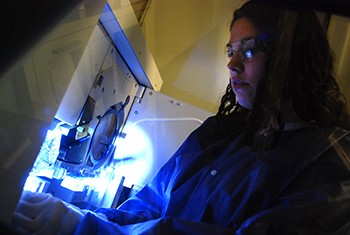 Victoria Czabafy ’15 does forensic DNA analysis. Although forensic science has been taught and researched at Syracuse for more than a decade, FNSSI didn’t become a reality until 2011. Since then, it has responded to demand by offering an array of graduate and undergraduate opportunities in general and advanced forensics, nuclear and biomedical forensics, medicolegal death investigation, ballistics and forensic law.